My first blog post is about SAVING MONEY on detergent. Why spend your hard earned money buying detergent when you can make you own for “penny’s on the dollar”. I came across a recipe that I’ve been using for some time that works great. For only $30.00 you can make a year supply of detergent. By making your own detergent, you’re not only saving money but helping our environment by not supplying our landfills with plastic bottles, pollution and cost of shipping. 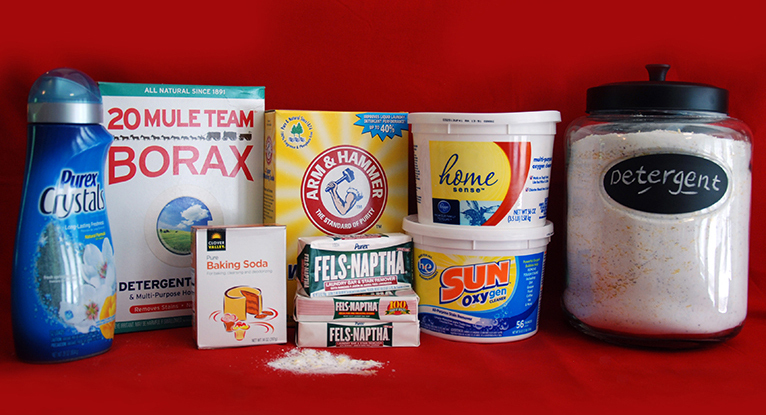 The process: Grate Fels Naptha Soap and pour all ingredients into bucket or trash bags. Stand back or use a dusk mask and mix with a long metal spoon in a bucket or toss in trash bags. Store in closed container. *Note: the oxiclean will come with a scoop and you could recycle it and use 2 scoops=1/2 cup for large load. Hi, Thanks for the recipe. I will try it out. Great idea. Spending a little time and save a lot of money. How long/ how many loads would you say this lasts? I have apartment appliances so i’m sure it’ll last a little longer in mine as they are smaller than typical. Of course, it depends on how much you wash. For a two person household I would say it lasts for about six months. Try it out and let me know how long it takes you. Also how much would you say all of those supplies cost? You can spend $30.00 on supplies for your DIY Detergent and it will last a year.